The impoundment next to the Meadowlands Environment Center at DeKorte Park Plaza in Lyndhurst is a great spot to watch egrets — especially when water levels are low. But when the impoundment fills with water, the egrets have had no place to perch — until now. 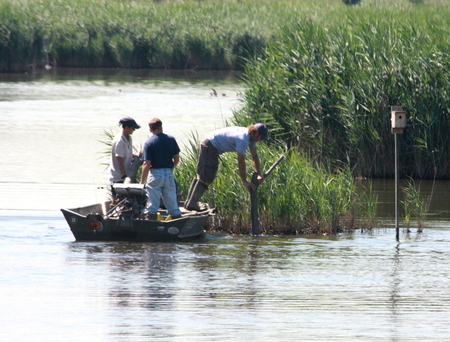 Last week, NJMC naturalists imported several sturdy branches and sunk them into the mud, in hopes they will attract egrets? The question now is, how will the egrets respond? Welcome to the Meadowlands Blog, a celebration and exploration of the natural wonders to be found in North Jersey’s 30.4-square-mile Meadowlands District. We at the New Jersey Meadowlands Commission want this blog to be as informative as we can, so if you have a significant bird sighting or any other noteworthy event, contact Communications Officer Jim Wright, who tends to this site Mondays through Fridays.